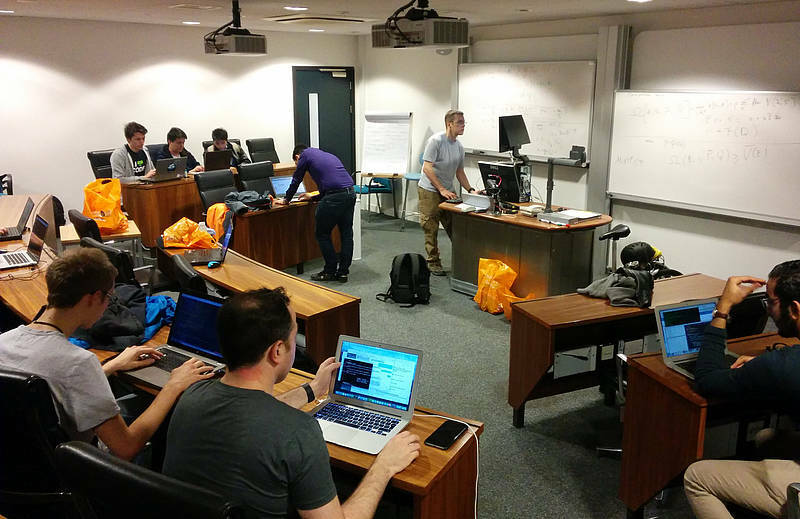 Team THOR, UCL’s Capture the Flag (CTF) team, took part in its first CTF competition – the UCSB iCTF, on the 4th December 2015. The team comprised of students from the computer science department – Tom Sigler, Chris Park, Jason Papapanagiotakis, Azeem Ilyas, Salman Khalifa, Luke Roberts, Haran Anand, Alexis Enston, Austin Chamberlain, Jaromir Latal, Enrico Mariconti, and Razvan Ragazan. Through Gianluca Stringhini’s hacking seminars and our own experience, we were eager to test our ability to identify, exploit and patch application vulnerabilities. The CTF competition style was “attack and defence” with a slight twist – each participating team had to write a vulnerable application. We were provided with a Linux virtual machine containing all of the applications which we hosted on a locally running server. This server connected to the organiser’s network over a virtual private network (VPN). During the competition, the organiser regularly polled our server to make sure each of the applications were running and whether or not they still had a security vulnerability. We were scored on 3 criteria: how many applications were up and running (and whether or not the vulnerabilities had been patched), how many flags we had managed to obtain through exploiting vulnerabilities and how close our submitted application was to the median in terms of being vulnerable, but not too vulnerable. The application had to be “balanced” in terms of security i.e. if it was too easy or too difficult to exploit then points would be deducted. Fortunately, the organisers provided sample applications which gave us an excellent starting point. One of the sample applications was a “notes” service written in PHP – it enabled a note (which represented the flag) to be saved against a flag ID with a password. The note could be retrieved by supplying the flag ID and password, but a vulnerable CGI script enabled the note to be retrieved without a password! We customised this application by removing the CGI script (this vulnerability was very easy to identify and exploit) and changing the note insertion code so that a specially crafted token (a hex-encoded Epoch timestamp) was added next to each flag ID, password and note entry. A vulnerability was then introduced whereby note retrieval would be a two-step process – first the flag ID and password would be specified, then if the password was valid, the token would be retrieved and used in combination with the flag ID to retrieve the note. The first step of the process could be bypassed by brute-forcing the token and avoiding the password verification phase. We kept our fingers crossed that this would be exploitable by the other teams, but not too easily! Attacking involved analysing the various applications written by the other teams for vulnerabilities. As soon as a vulnerability had been identified, we had to write some code to perform the exploit and retrieve the flag for that application. The flag served as evidence that we had successfully exploited an application. To maximise attack points, we had to run the exploit against each team’s server and submit the flags to the organiser every few minutes. Defence involved ensuring that the applications were up and running, keeping the server online and ideally patching any vulnerabilities identified in our copies of the applications. The competition started at 5pm – we were online with our server and applications shortly afterwards. Fueled by adrenaline, caffeine, and immense enthusiasm, we chose several applications to focus our initial efforts on and got cracking! A good portion of the applications were web applications written in PHP. This was great news as we had focused on web application vulnerabilities during the hacking seminars. We also identified applications written in Python, Java, C and Bash. Some of them were imaginative and amusing – a dating service for monkeys written in PHP, a pizza order and delivery service written in PHP and a command-line dungeon game written in C.
We managed to exploit and patch an ATM machine application through a SQL injection vulnerability (the same security vulnerability involved in the recent TalkTalk and vTech data breaches). One of the Python applications used a “pickle” function which was exploited to enable arbitrary code execution. A second Python application was vulnerable to a path-traversal bug which enabled flags to be retrieved from other user’s directories. We also were on the cusp of exploiting a buffer-overflow vulnerability in a C application, but ran out of time. The competition ran for 8 hours and at the end, THOR ranked 14th out of 35. Given that it was THOR’s first time participating in a CTF, being the only team to represent the UK and being up against experienced teams, we felt that it was a great result! We had a huge amount of fun taking part and working as a team, so much so, that we are planning to take part in more CTF competitions in the future! Many thanks again to Gianluca, the organisers and all who participated. Go THOR!